Katherine Stats, West Glacier Paradise. Oil on linen panel 18x24. Linda Tippetts, Sperry-Chalet II. Oil on linen, 24x30. She’s speaking at the Hockaday, at a recent talk about art, science and fire management using pieces from the museum’s Timeless Legacy exhibition to help people see the give and take fire imparts on a landscape. 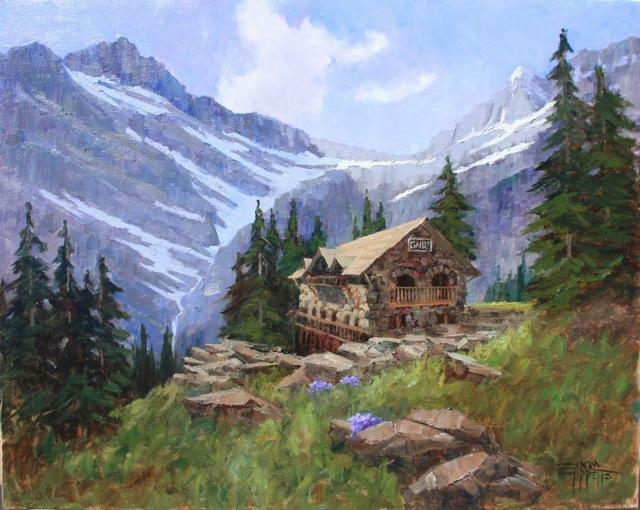 Martin says this painting by Montana-born Linda Tippetts is likely one of the last captured en plein air before the Chalet’s dormitory burned in the Sprague Fire in August 2017. Timeless Legacy is an annual showing of American and Canadian artists’ work featuring both sides of the Glacier-Waterton International Peace Park. “There's so much more in these paintings when you start to understand some of the ecology of fire,” says Ali Ulwelling, with the state Department of Natural Resources and Conservation. 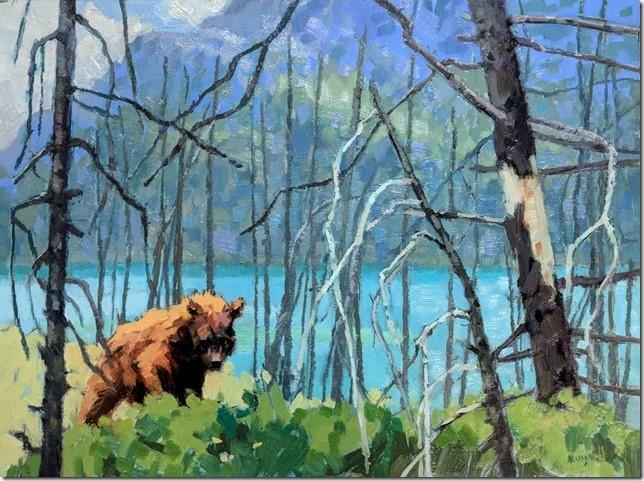 She points to a small oil painting of a black bear tromping through a stand of charred stumps. A woman in the audience said it shows the devastating effects of wildfire. But Ulwelling sees something different in Erica Neumann’s painting. Erica Neumann, Life on the Sun. Oil on panel, 9x12. Ulwelling sees fire impacts in other paintings, too, like Jill Carver’s splashes of purple fireweed and lurid red and orange sunsets, or the muted colors and broad brush strokes Catherine Stats used to depict smokey river scenes. Jill Carver, Fireweed Renewal. Oil on linen panel, 10x10. Rick Connell sees fire even in paintings of lush green hillsides. “You don't see fire in the landscape, but fire's borne of and fire maintains the landscape, the vegetation,” he says. Connell is the fire management officer for the Flathead National Forest. He points to a large oil painting of a sweeping landscape: rusty river in the foreground, evergreen trees on the opposite bank, a clear meadow at the foot of a towering cliff face in the distance. “In order to have a beautiful landscape, it had to start from something that probably burned in some time frame,” Connell says. Connell has more than a century’s worth of observations and data to back this up. Landscapes naturally burn in cycles that last about as long as it takes the forest to regrow. Grasslands on the park’s east side burn frequently, maybe every 25 to 40 years. The fir and larch forests that flank the peaks of the Continental Divide burn every 150 to 200 years. The cedars and hemlock near Avalanche Lake might only see fire every 500 years. 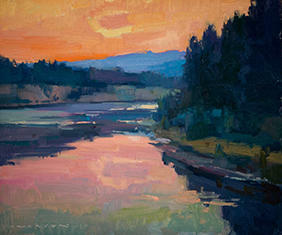 Jill Carver, September Sunset on the Flathead. Oil on canvas, 10x75. “You can kind of look at, 'well hey, I can see where there's different patterns on the landscape,' in these pictures that are being captured and drive that home for you, and maybe not necessarily look at some of these pictures with burnt trees and think it's all catastrophic, because it's renewal,” Connell says. Glacier National Park's Fire Management Officer Dave Soleim says the large fires Glacier has seen in the past few summers aren’t surprising when you look at historic burn patterns in the area. Soleim says it’s possible to change an area’s fire regime — that’s the typical intensity, severity, size, pattern and time between burns — by changing the makeup of a forest, for example through selective logging or prescribed burning. But fire managers will never be able to knock fire off the landscape entirely. As the lecture wrapped up, I caught up with the woman who thought of wildfires as devastating. Her name is Annette Barkley-Rippons. “What do you think of now?” I ask her. 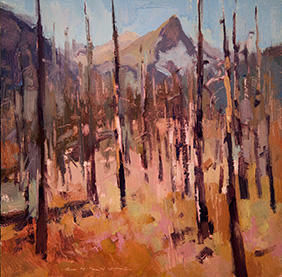 The Timeless Legacy exhibit runs now through December 1 at the Hockaday Museum of Art in Kalispell. Mark Ogle, St. Mary Lake Glacier. Oil, 15x30. 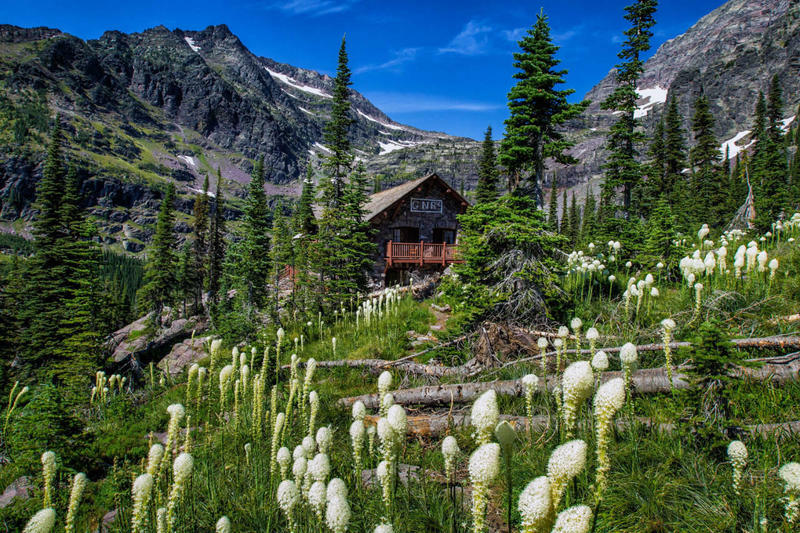 One of Glacier National Park’s historic backcountry lodges was lost to the Sprague Fire Thursday evening. The main building at the Sperry Chalet burned despite firefighters’ best efforts. The team had staged there for the past week to lay an extensive hose, sprinkler and pump system around all of the structures associated with the Chalet.